A salt water chlorinator is a great tool for many households that want to improve the sanitation of their pool and reduce the need to add chemicals to the water. 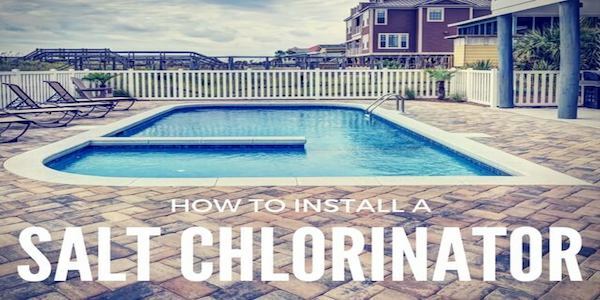 While they don’t completely eliminate the presence of chlorine in the pool, they are often seen as a safer, more convenient way to keep the water clean. With the right unit integrated into the pump & filtration system, and enough salt to kick-start the process, users can improve the quality of the water in a more beneficial manner. This all sounds very good in theory, so this article addresses the question – How to Install a Salt Chlorinator? Your manufacture will have detailed instructions relating to your particular unit. Our purpose here is to give you an idea of what’s involved in theory so you can make an informed decision about installing a chlorinator. In the most simplistic terms, all you are doing here is installing the chlorinator cell so that it cuts into the return line of the system. This is the line that takes the water back to the pool from the filtration system. This means that the unit is then securely connected to the pools plumbing for a consistent process. Most pump installations are plumbed with either 40mm or 50mm PVC pipe. Check which size your chlorinator cell is. If necessary you can purchase adapters from your local plumbing supplies shop. Plan ahead of time and installation will be easier. Check carefully that you have enough pipework to cut out a gap to fit the cell. If not, you may need to do some creative plumbing. Ensure you use some sort of glue to join any additional pipework together to prevent any leaks. The chlorinator also needs to be connected to the electricity supply via the power outlet and the powerpack that comes with most units. At this point it is important to remember that all models vary in design so it really is important to read the instruction manual carefully. For example, some models are 120V and others are 240V. Adding the wrong one could be disastrous. Please only attempt to do this if you are confident in what you are doing. In addition, please recheck the manufacturers’ instructions – we have seen a few that actually reduce the warranty of the unit if it is not installed by a professional. Of course, in addition to the pumping system and electronics, there is the issue of the salt. No salt in the water; no salt chlorination process which can damage the cell if the unit is not equipped with a safety mechanism that checks the level of salt in the water. The first thing to remember is to use the right salt for the job. You need the right kind of crystals that will react with the water for the desired effect (no dumping table salt in and hoping for the best). The salt also needs to be added in the right place and at the right time. The faster that the salt can disperse through the pool water, the quicker the chlorination process. This means it is better to add the salt to the deep end or over jets, which can propel it through the water. Also be aware of when you add the salt and when you want to use the pool. There isn’t a lot to the job, but there are still important electrical and plumbing processes to deal with and we could get quite bogged down in details in this simple how to install a salt chlorinator article. The most important thing to remember when learning how to install a salt chlorinator in your pool is that it is not a basic DIY job with a few simple attachments. This unit becomes a part of the plumbing and electrical system of the pool, and you therefore need to be able to bypass and manipulate both for a successful installation. Clearly, this means that one wrong move could be costly, potentially damaging the system entirely and leaving the pool in a bit of a mess. If you have the confidence and knowledge to do tackle this alone, it can be done. However, anyone that has doubts about working with the system should call in a professional.